Yesterday we saw the cover art for the upcoming Rockman 25th anniversary rock and techno albums. One of the things about covers is that they are adorned with the sprites of Robot Masters. As it turns out, many of the sprites are actually new: for each Robot Master there is one new "hurt" pose. At first glance, one could say they're straight out of Battle & Fighters which features similar comical hurt poses. But they aren't. These are freshly brewed sprites. Cutstuff message board user geno tried his hand at recreating some of the new sprites, as seen above. The addition of color really shows off just how quirky they are. I mean c'mon; Pharo Man's eyes are about to burst out of his head! You'll find the rest of the lot after the break. Until a high resolution version of the rock album cover emerges, geno is unable to reproduce the reminaing sprites (Wood Man, Metal Man, Crash Man, Elec Man and Air Man). My absolute favorite has to be Air Man (third column from left, bottom row). It's a little hard to see as is, but that thing just above him is suppose to be his fan. It's been ripped right out of his chest! Or maybe it just fell out. Nah, the former is way more fun to imagine. All in all, super quirky stuff. You can tell Capcom had a lot of fun putting these together! Should anyone get to recreating the remaining sprites, I'll be sure to update this post. oh god what is happening to Hard Man?! I think I'll take a crack at the few remaining robot masters there. I've got some free time. Love the SnakeMan! Totally making a bead sprite of that! All of Hardman's sprites are new (although one look slike it's from the Pocketstation). These sprites were probably first made for the 20th annaversary. I've actually got a much clearer image of the graphic on the bracelet. I once toyed with the idea of recreating the sprites, but never did. Is anyone interested in remaking these sprites? Boy, do I feel sheepish! I never knew these were from the 20th anniversary. Kinda shoots down any ideas of them being from a recently in-progress game! //they're from Scramble Battle! !// Thanks for posting! And for sure Gauntlet; any high-res pics of the new sprites will be put to good use! It looks like Hard Man has a blond mustache of some sort. From now on, I am imagining Hard Man with a blond mustache. Heat Man looks so cute! Well, I sent what i had to Protodude. I don't really have much, just some of their old promo work. But the sprites weren't shrunk to nothing. Umm, Don't blame me if I'm wrong BUT, I don't think that's Drill Man. Looks more like Crash Man. You can tell by the iconic helmet/shield thing he has. Sir, you have a keen intuition! Look at the compiled frames taken from the album covers on the original post. THEN look for the specific Robot Masters on THIS sheet from Sprites INC. These are perhaps not new at all! They might hail from the PS1 Complete Works games, known to have been compatible with the Pocketstation! Someone needs to dig through those games right about now and take the actual hurt frames straight from the source...that is, if I'm correct. Don't know if anyone's checkign this or cares anymore, but I've posted the R20 images to my own site now as well. Confirmed: Those sprites ARE from the PocketStation mini-games! The bosses also have a new two frame (one with Rockman) victory animation. Well, at least Metal Man's victory pose is original. So far the victory poses of Mega Man, Bubble Man, Quick Man, Heat Man and Wood Man don't use "new" sprites, but there are other originals besides the hurt sprites, like Crash Man's attack animation and Special Weapons. But for the Pocketstation to be able to do that, it must first need to obtain the data from a PS1 game. Which is why I believe these sprites are located inside the Complete Works re-releases, for it is previously needed to download data to a Pocetstation in order to be able to become a stand-alone portable gaming console. Correct me if I'm wrong, but there are 6 Complete Works re-releases, yes? Maybe each game has its corresponding set of Robot Master graphics available for download into a Pocketstation device. 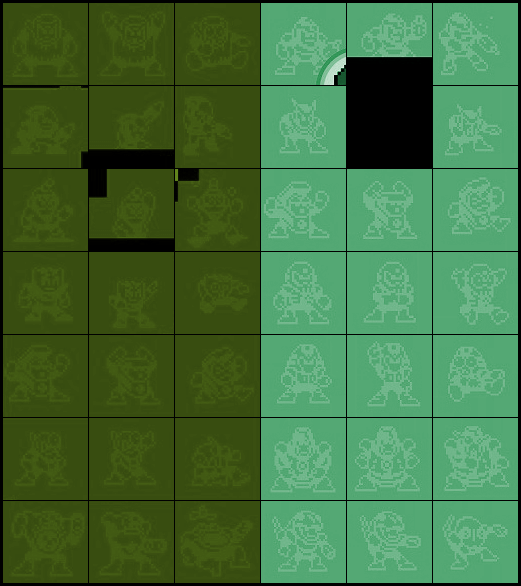 If the actual pet training game can be emulated, then all that is really needed is a screenshot of the emulation showing the hurt/defeated frames. Also, for convenience's sake, why don't we redirect all future discussion towards the Cutstuff Forums thread?